- Read the material — learning objectives and summaries highlight critical information. - Take the optional quizzes to test your comprehension. - Pass the final exam — unlimited attempts within your 1-year enrollment period. - Print your Proof of Completion — to qualify you to apply to take the State Notary Exam. 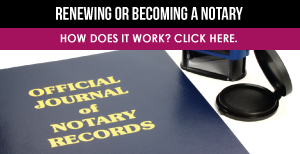 Become a California notary public now and expand your real estate services. This course may also be taken to fulfill the requirements for an expired notary.